Apologies for this slightly late announcement, but I’ve been keeping my head down to finish the first draft of Sol, the fifth book in the Silver Ships series. Belatedly, I’m pleased to announce that the Méridien audiobook, the third audiobook in the series, is online in both MP3 and CD formats. My sincere thanks to all the fans who have waited so patiently for the continuation of the audiobook series. 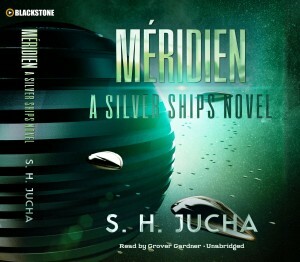 Visit Amazon.com, Audible.com, or Blackstone Audio for your copy of the Méridien audiobook, narrated by Grover Gardner and distributed by Blackstone Audio. This entry was posted in Readers, Uncategorized on April 12, 2016 by Scott Jucha.